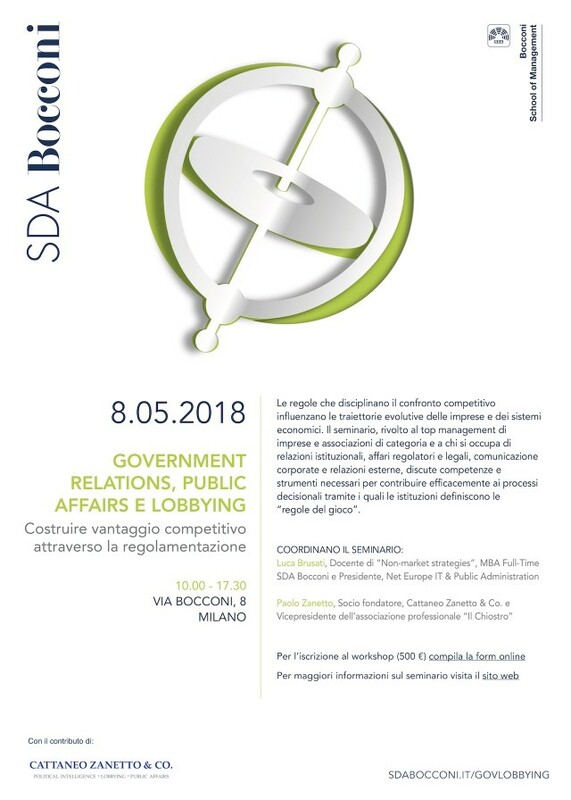 Bocconi School of Management Seminar on Government relations, Public affairs and Lobbying - Cattaneo Zanetto & Co.
Bocconi School of Management with the support of Cattaneo Zanetto & Co. is organizing the first executive seminar “Government relations, Public affairs and Lobbying” on Tuesday, 8 May 2018 at its campus in Milan. The seminar is aimed at executives of companies and associations (chairmen, C-suite executives, board members) and to their supporting staff in charge of Government affairs, Regulatory affairs, Legal affairs, Corporate communication and External relations. The seminar is also aimed at founders of startups who consider innovation in an obsolete regulatory framework a key competitive advantage. The seminar’s faculty is composed by Luca Brusati, senior professor at Bocconi School of Management, and Paolo Zanetto, founding partner of Cattaneo Zanetto & Co.